THIS year's Brisbane Art Prize (BAP), founded and directed by former Gympie artist Cathy Condon, was launched with all the passion and glamour the prize is gaining attention for. 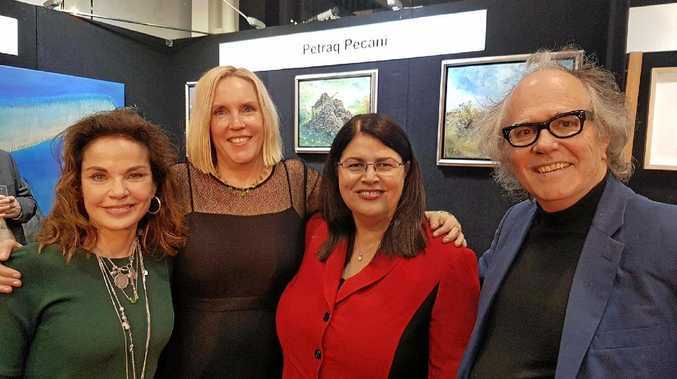 The annual international exhibition that boasts a $10, 000 prize was launched in Fortitude Valley with a surprise visit from well-renowned Australian actress Sigrid Thornton of Seachange fame. Ms Thornton collected a painting gifted to her by Albanian artist Petraq Pecani, a Brisbane Art Prize finalist who, as a young boy in communist-controlled Albania, was inspired by Thronton's character of Philadelphia in All the Rivers Run. "I remembered her lengthy journey on that steamer boat and the many challenges she faced and how she would courageously pick up her paint brushes,” Mr Pecani wrote when he entered the prize. When the TV show was airing in Albania, Mr Pecani said you could see shocking things done to those pursuing the arts; poets executed, imprisoned artists living in exile. "Tenors of international calibre were pushing wagons in the coal mines, or successful authors reaping by hand the wheat in the fields under the scorching sun. BAP director Cathy Condon said Mr Pecani's inspirational story was just one reason it was so important to invest in art. The Brisbane Art Prize, of which Gympie artist Stephanie Robson is a finalist, will run at the Judith Wright Centre of Contemporary Arts from October 5 - 28 with the winner announced at an awards evening on October 12. Gympie-owned Kenilworth Dairies is a BAP sponsor.